Hamilton finished 2018 having caught 30 of 46 targets for 243 yards and two touchdowns. Hamilton caught five of eight targets for 49 yards in Sunday's 23-9 loss to the Chargers. 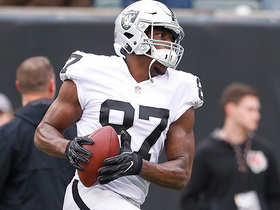 Hamilton hauled in six of his nine targets for 40 yards and a touchdown in Monday night's 27-14 loss to the Raiders. 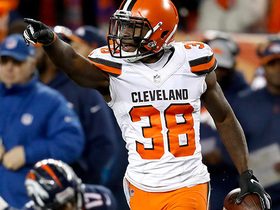 Hamilton caught seven of 12 targets for 46 receiving yards during Saturday's 17-16 loss to the Browns. 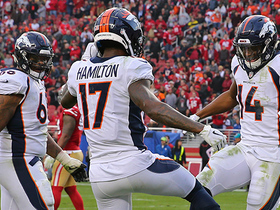 Hamilton brought in seven of nine targets for 47 yards and a touchdown in the Broncos' 20-14 loss to the 49ers on Sunday. Analysis: Hamilton co-led the Broncos in receptions, helping them in the first game without Emmanuel Sanders (Achilles). The rookie from Penn State's reception, receiving yardage and target totals were all career highs, and his 1-yard touchdown reception with 3:53 remaining brought Denver to within six points. Hamilton's ability to take advantage of extra snaps was certainly encouraging, giving him a solid fantasy outlook heading into a Week 15 battle against the Browns next Saturday night. Hamilton is one of four healthy wide receivers on the Denver roster after Emmanuel Sanders likely suffered a torn Achilles' tendon during Wednesday's practice, Zac Stevens of BSNDenver.com reports. Hamilton finished without a target on 47 snaps in Sunday's 24-10 win over the Bengals. Analysis: Hamilton actually led all Denver wideouts with an 80 percent snap share, getting more playing time than Courtland Sutton (41 snaps), Emmanuel Sanders (40) and Tim Patrick (21). An easy win provides part of the explanation, but it does seem Hamilton has at least bypassed Patrick for the No. 3 job, albeit in a run-first offense. The Broncos travel to San Francisco in Week 14. Hamilton caught one of two passes for 13 yards during Sunday's 24-17 win over Pittsburgh. Hamilton (knee) was listed as a full practice participant Thursday, Zac Stevens of BSNDenver.com reports. Analysis: Down the road, Hamilton could carve out a more prominent role in the Broncos offense, but currently Emmanuel Sanders and Courtland Sutton are the team's only notable wideouts from a fantasy perspective. Hamilton (knee) was limited at practice Wednesday, Zac Stevens of BSNDenver.com reports. Analysis: With just four catches on six targets for 48 yards in eight games to date, Hamilton isn't currently on the fantasy radar. That said, with wideout Demaryius Thomas no longer on the team, Hamilton -- once healthy -- could carve out a more prominent role in the Denver offense behind current starters Emmanuel Sanders and Courtland Sutton. Hamilton re-injured the same knee on which he suffered an MCL sprain Oct. 18, Mike Klis of 9News Denver reports. Analysis: Hamilton made it back on the field coming a Week 10 bye, only to hurt the same knee during Sunday's 22-21 win over the Chargers. He caught one of two targets for four yards before exiting the game late in the second quarter. Tim Patrick served as Denver's No. 3 receiver the rest of the way, finishing without a catch on just one target. Hamilton doesn't seem like a good bet to be available for Week 12 against the Steelers. 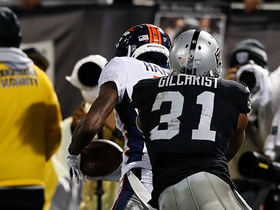 Hamilton exited Sunday's game against the Chargers late in the second quarter with a knee injury, the Broncos' official site reports. Analysis: Prior to being forced out of the game, the 2018 fourth-rounder logged one catch (on two targets) for four yards. Hamilton (knee) was a full participant at Thursday's practice, Aric DiLalla of the Broncos' official site reports. Hamilton (knee) was a limited participant in Wednesday's practice, Ryan O'Halloran of The Denver Post reports. Analysis: Hamilton has missed two consecutive games due to a lingering knee issue but appears to have made progress in his recovery coming off a bye week. If the rookie fourth-round pick is able to get healthy in time for Sunday's tilt against the Chargers, he could unseat Tim Patrick as the Broncos' No. 3 receiver behind Emmanuel Sanders and Courtland Sutton. Hamilton (knee) expects to return for Sunday's game against the Chargers, Troy Renck of Denver 7 News reports. Analysis: Coming out of a bye week, Hamilton will be exactly one month removed from suffering his injury when the Broncos travel to Los Angeles in Week 11. He's at the long end of the typical recovery timeline for an MCL sprain, with a chance to usurp Tim Patrick for the No. 3 wide receiver job. 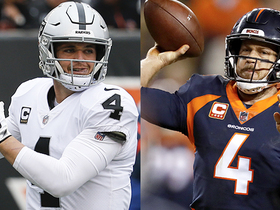 The role isn't likely to correlate with regular production in Denver's mediocre passing attack, but a strong finish to the season could put the rookie fourth-round pick in line for regular targets next season. Coach Vance Joseph is hopeful Hamilton (knee) can return after the Broncos' Week 10 bye, Troy Renck of Denver 7 News reports. Analysis: The rookie wideout has already missed two games while recovering from an MCL sprain, allowing Tim Patrick to go unchallenged for the No. 3 receiver job after Demaryius Thomas was traded to Houston last week. The Broncos probably would like to see Hamilton seize the role, but there's no guarantee it happens immediately after the bye week. Hamilton (knee) said he hopes to return to action Week 11 against the Chargers, Ryan O'Halloran of The Denver Post reports. Hamilton (knee) isn't practicing Wednesday, Troy Renck of Denver 7 News reports. Analysis: Hamilton's stock went up when Denver traded Demaryius Thomas to Houston on Tuesday, but the rookie needs to recover from an MCL sprain before he can take advantage of the opportunity. Courtland Sutton seems to have the No. 2 wide receiver job locked down, while Hamilton may need to compete with Tim Patrick for the No. 3 gig once he's healthy. Hamilton has two more chances to practice before Sunday's game against Thomas and the Texans. Hamilton (knee) has been ruled out for Sunday's game at Kansas City, Nicki Jhabvala of The Athletic reports. Analysis: Hamilton has made nary an impact as a rookie, recording all three of his catches on four targets between Weeks 5 and 6. After suffering a sprained MCL in Week 7 in Arizona, he's facing a multi-week absence. 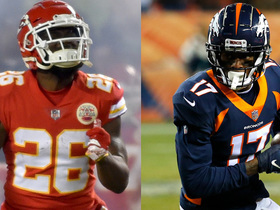 There haven't been many targets available beyond Emmanuel Sanders, Demaryius Thomas and Courtland Sutton in the Broncos' receiving corps, but the unproven Tim Patrick and Isaiah McKenzie represent the other available wideouts. Hamilton (knee) isn't participating in Thursday's practice, Nicki Jhabvala of The Athletic reports. Analysis: With two absences from practice to open Week 8 preparations, Hamilton looks to be trending toward an inactive status Sunday in Kansas City. 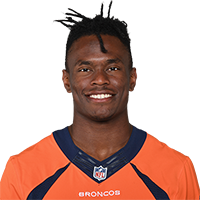 Presumably in recognition of the likelihood that Hamilton will sit out this weekend, the Broncos promoted Isaiah McKenzie from the practice squad Thursday to provide another body at receiver and in the return game. Hamilton (knee) isn't practicing Wednesday, Mike Klis of 9News Denver reports. Analysis: Hamilton suffered an MCL sprain during last Thursday's 45-10 win over the Cardinals, an injury that will likely sideline him for at least one game. Tim Patrick will step in as the Broncos' No. 4 wide receiver if Hamilton isn't available Sunday in Kansas City. Coach Vance Joseph said Hamilton is "day-to-day" with a sprained MCL, Nicki Jhabvala of The Athletic reports. Analysis: Hamilton was the victim of having his right knee rolled up on last Thursday in Arizona. Typically, such an injury would be accompanied by an absence of some sort, but at the moment he hasn't been ruled out for Sunday's game at Kansas City. Hamilton said he's dealing with a sprained knee, Troy Renck of Denver 7 News reports. Analysis: Hamilton, who had his right knee rolled up on last Thursday against the Cardinals, was seen wearing a knee brace in the locker room Monday. While it's highly unlikely the rookie will make it back for Week 8, it's a blessing Hamilton isn't dealing with a more severe injury considering how dangerous last Thursday's incident appeared to be. Hamilton (knee) is expected to undergo an MRI on Friday, Jeff Legwold of ESPN.com reports. Analysis: Hamilton sustained what appeared to be an ugly injury in Thursday's 45-10 win over the Cardinals when another player inadvertently rolled into his right leg while he was making a fair catch on a punt. Though the extent of Hamilton's injury won't be known until after the results of the MRI are read, initial indications suggest he could be dealing with an MCL sprain, according to Zac Stevens of BSNDenver.com. Analysis: Hamilton suffered what appeared to be a nasty injury when making a fair catch on a punt, with a Cardinals player rolling right into his leg. Philip Lindsay has already fielded two punts Thursday, so he would figure to become the main return man for the Broncos with Hamilton out. Hamilton could return punts during Thursday's game against the Cardinals, Troy Renck of Denver 7 News reports. Analysis: Hamilton's window of opportunity comes with Adam Jones (thigh) ruled out for Week 7. 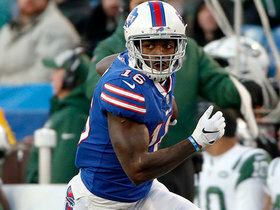 Return touches would be good news for rookie fourth-rounder, who has struggled to receive substantial targets behind fellow rookie Courtland Sutton and the team's top two receivers, Emmanuel Sanders and Demaryius Thomas. Hamilton caught all three of his targets for 44 yards during Sunday's 34-16 loss at the Jets. Hamilton caught one of two targets for 18 yards during Saturday's preseason game against the Bears. Hamilton was targeted once, but did not record a catch during Saturday's 42-28 preseason loss to Minnesota. Analysis: Paxton Lynch missed Hamilton down field for what was the rookie receiver's lone target. Denver reportedly did not gameplan for Minnesota, deciding -- instead -- to practice specific concepts. That makes reading too much into any usage difficult to do. 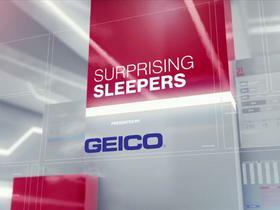 It is worth noting, however, that fellow rookie and Hamilton's primary competition for the No. 3 receiver job, Courtland Sutton, was targeted thrice to Hamilton's once. Though not the same kind of athlete, Hamilton is ahead of fellow rookie Courtland Sutton when it comes to the finer points of playing receiver, Benjamin Allbright of 104.7 FM Denver reports. Denver Broncos wide receiver DaeSean Hamilton hauls it in for a 7-yard touchdown against the Oakland Raiders. The "NFL Fantasy Live" crew discuss fantasy bench players that are getting more opportunities in Week 16. 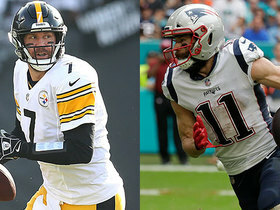 The "NFL Fantasy Live" crew discuss several fantasy hype trains heading into Week 15 and whether or not you should start them. Denver Broncos wide receiver DaeSean Hamilton's first NFL touchdown comes at critical time for the Broncos on a pass from his quarterback Case Keenum. 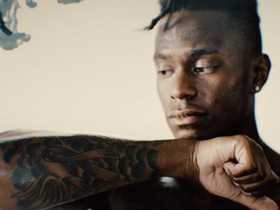 In this "Art in the Game" piece, Denver Broncos rookie wide receiver DaeSean Hamilton explains the meaning behind several tattoos on his body.